Fall Book Sale: Saturday October 23rd. We are currently accepting donations of good used books, for children or adults, general interest (no textbooks please). Thanks to everyone who has donated. You have been very generous. UPDATE: No more donations please. We have no more storage room. This small, urban, pocket park is located in the commercial "Takoma Junction" area of Takoma Park. It is named for Benjamin Yeo Morrison, the developer of the Glen Dale azaleas and a resident of Takoma Park for many years. Morrison first became interested in azaleas when, after receiving an M.A. in landscape architecture from Harvard in 1915, he traveled to Asia on a Sheldon Fellowship. After serving in World War I, he became a horticulturist for the U.S. Department of Agriculture and eventually the director of the National Arboretum and a founder of the American Horticultural Society. Although Morrison named his azaleas for the Glen Dale Station of the Department of Plant Exploration and Introduction, he developed many of his hybrids in a two acre garden in Takoma Park. Azaleas grow all over Takoma Park, but they are notably absent from the park named in Morrison's honor. It is instead dominated by the James Colwell mural pictured above, which commemorates music, not flowers. Yet art and music were Morrison's other great loves. He was a landscape painter and a master of botanical drawing. He composed an opera libretto, Salve Regina, and gave professional lieder concerts. He had a fine, sensitive baritone voice and he often was his own accompanist. He sang as a soloist with choirs, and occasionally gave voice lessons. I have been told that he was offered an opportunity to try out for the Metropolitan Opera. Each day brought new surprises, for not only was he a great plantsman, and an able artist, but his love and knowledge of music added to our enjoyment. He gave us a wonderful evening in the little church where he worked and prayed - here he sang for fully two hours accompanying himself on the piano. We listened spellbound to ballads, Jewish chants, the songs of John Ireland and Brahms ... it was unforgettable. Hybrids and Hybridizers: Rhododendrons and Azaleas for Eastern North America, edited by Philip A. Livingston and Franklin H. West. Harrowood Books, Newtown Square, Pennsylvania, 1978. In addition to the above book, the Takoma Park Maryland Library owns a copy of Morrison's 1953 U.S.D.A. monograph, Glenn Dale Azaleas, and a 1978 reprint published by Thophrastus. Copyright for the picture at the top of the page is held by the City of Takoma Park. The artist is James Colwell. The July 2010 Takoma Park Newsletter had updated information on the mural, accompanied by a photo by Laurie Stepp. Look for page 5. Guarding the Neighborhood Eighteen years ago, James Colwell painted the brilliantly colored, vibrantly animated mural, �Guardians of the Neighborhood,� in the pavilion at the corner of Carroll and Ethan Allen avenues. Last month, he did a major touch-up, repainting the piece to brighten its effect and keep the artwork from showing its age. �Guardians,� which depicts a lively jazz club-type scene, is one of the most familiar of Takoma Park�s public art pieces, as it is geographically central to the City at Takoma Junction. It is painted on the wall of what was originally a gas station, then a thrift shop; the structure is part of B.Y. Morrison Park, named for the Takoma Park azalea collector responsible for the �Azalea City� designation. The pavilion�s columns are covered in ceramic tiles by Takoma Park artist John Hume; these also illustrate the town�s quirky heritage, with representations of Roscoe the Rooster, Motorcat, and Root Boy Slim, among others. Colwell, who is a professional piano restorer by trade, remembers that the mural stirred some controversy when it was new: he had to raise the neckline of the sensuous dancer on the right. The Takoma Park Housing and Community Development Department publishes a landlord tenant handbook and model lease forms for Takoma Park rentals. It also offers mediation and conflict resolution. Washington Post Apartment Showcase Choose Takoma Park in the drop-down box of cities. Please remember, many places with postal addresses of Takoma Park 20912 are not actually in the City of Takoma Park. For example, Fairview Avenue is in an unincorporated area of Prince Georges County. So is 6733 New Hampshire Avenue. The zip codes do not correspond to the political/service/school boundaries. All Labor Day weekend the Takoma Metro station will be closed, as will all stations north of Takoma. If you want to go downtown via Metrorail, you will need to make your way to Fort Totten, not easy unless you live along New Hampshire Avenue which has the K6 bus (a pdf file). Update: Metro clarified their post: the shuttle between Fort Totten and Glenmont is actually going to stop at each station in between, including Takoma. More information about the Labor Day closing . 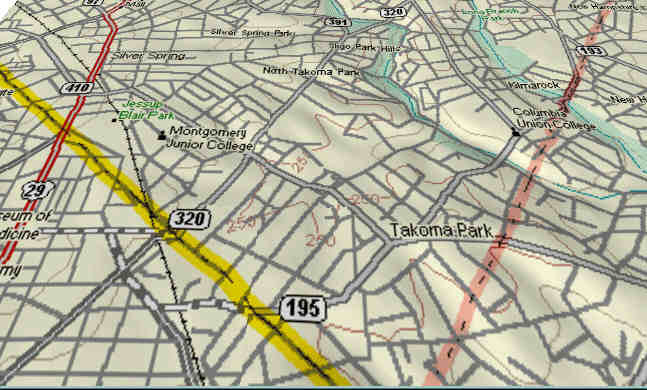 Bus routes in Takoma Park (a pdf file). Takoma Park does not have its own school system. Children attend private schools or Montgomery County public schools. Takoma Park Middle School in Takoma Park (grades 6-8). Please read Faith Stern's history of the Takoma Park Middle School / Junior High. The County ESOL and GED programs are now administed by Montgomery College, not the Montgomery County Public Schools. 301.962.8950. Currently none of these classes are held in Takoma Park. 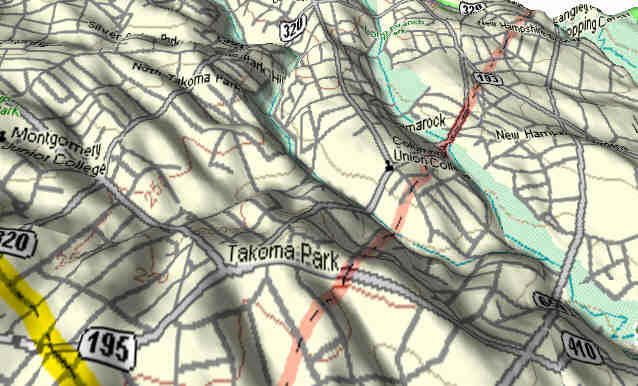 Takoma Park lies right on the fall line, the border between the Piedmont Province and the Atlantic Coastal Plain. 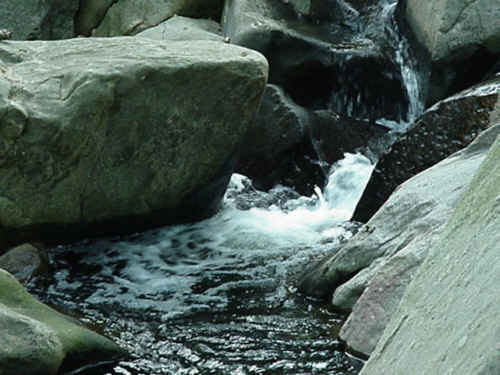 The Piedmont soils in the north and west parts of the City are derived from an ancient underlying schist. Soils in the southeast section come from more recent upper Coastal Plain sediments. Elevation 214 feet above sea level (at the library). The climate is very similar to that of College Park, which is only four miles away. The Weather Channel also has some local climatology statistics. see also: Maryland State Climatologist Office. FEMA's advice for severe weather preparation. click "Launch 360 View" to see street views beginning at the library. Landsat images of this area from a University of Virginia site. generalized geologic map of Maryland. Yes, we know that if you don't have electricity or an Internet connection you can't read this, but we are open. The Takoma Branch of the DC library system is closed, as are the nearby Montgomery County libraries: Silver Spring, Long Branch, White Oak and Wheaton. But, as we are substituting for so many places, we have a shortage of outlets for laptops so we are plugging in a variety of power strips and UPS boxes. Power is surging here so we don't know what will happen this evening. The following image clips are from the generalized geologic map of Maryland produced by the Maryland Geological Survey. Please note that the Montgomery - Prince George's County line as shown in the map reflects the old placement, before the City was unified into one county.